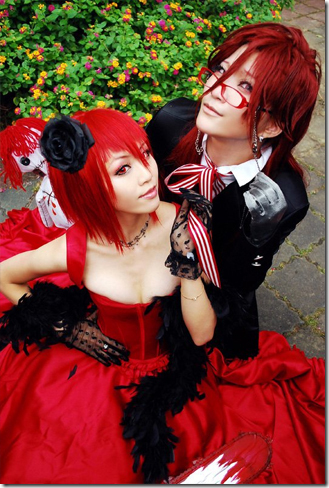 In Black Butler cosplay, there are always two “Red persons”, they are Madam Red and Grell Sutcliffe .Madam Red is Grell’s host, but in this Madam Red cosplay and Grell Sutcliffe cosplay, they are good partners. Sometimes, I misunderstand, Grell is a female? In the Black Butler anime, Grell always treats himself as a female, in fact, it is male. Madame Red is known for her and Red appearance. So her costume and hair are all red. Black Butler Madam Red cosplay costume and Red cosplay wig. Grell Sutcliffe is initially portrayed as worthless and is often seen trying to commit suicide after mishandling tasks. As a Grim Reaper, he is characterized with red hair and shark-like teeth. Originally, Grell wears a black suit similar to Sebastian, but after killing Madame Red, he throws his own coat away to wear her red coat hanging off his elbows instead. To portray Grell, you need this Grell Sutcliffe cosplay costume . Black butler cosplay costume is the basic props for black butler cosplay. Now here is the list of roles in black butler cosplay. Wearing this costume to play as a character in Black Butler cosplay show. This cosplay costume comes with jacket,vest, trousers, gloves, cravat. We also provide custom service for cosplay costumes and cosplay accessories. 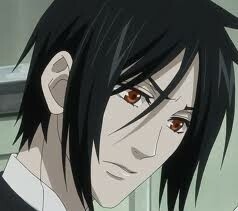 Sebastian Michaelis is the attractive butler of the Phantomhive household and acts as Ciel’s bodyguard. Sebastian’s appearance is similar to that of Ciel’s father; this has been revealed to be the cause of Ciel, who asked the demon to take the form of the previous Earl, Vincent Phantomhive. Of course, the similarity ends with his black hair and reddish eyes. Sebastian often describes himself through his catchphrase “I am simply one hell of a butler”. The phrase plays on the word “demon” and the phrase “to the end”. It can also translate to “I am a demon and a butler”. In Funimation’s English translation, this phrase becomes “I am a devilishly talented butler” or “I am one hell of a butler” which is, obviously, another play on his demonic origins. 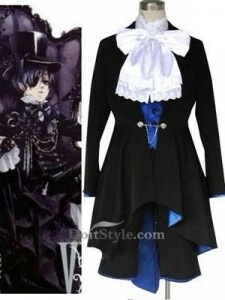 Wearing this costume to play the role of Ciel in Kuroshitsuji ciel phantomhive cosplay show.We also provide custom service for cosplay costumes and cosplay accessories. Ciel Phantomhive is the business-savvy, egotistical twlevle. head of the English Phantomhive noble family, taking over after the deaths of his parents, Lord Vincent Phantomhive and Lady Rachel Phantomhive. He runs the Funtom Company, which manufactures toys and sweets, with the later addition of a food branch after winning a Royal Warrant. His right eye, which is usually covered with a black eye patch, bears a pentacle, the sign of the Faustian contract he made with the demon Sebastian. Sebastian says that the mark on Ciel is proof of their contract. He also says that demons mark their prey so that they can locate them. 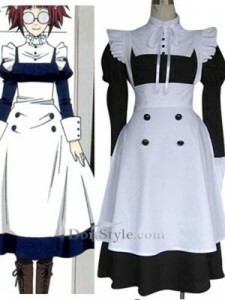 This cosplay costume comes with body skirt and apron. You could wear this costume as Maylene to attend a black Butler cosplay show. We also provide custom service for cosplay costumes and cosplay accessories. Mey-Rin is a clumsy maid whose cracked glasses do nothing to improve her clumsiness. However, she refuses to purchase a new pair as they are the first thing Ciel bought for her. Sebastian believes her main problem is her intelligence and not her poor eyesight. She has a crush on Sebastian as she blushes whenever she is in his presence and is even clumsier when Sebastian is watching. In the anime, she fantasizes about being close to him in episode 1. She is rather superstitious but admits to having a soft spot for scary stories. Mayline used to be a sniper who did not use a scope, due to her sharp far-sighted vision.